Turnaround levels can often be expedited after the initial service level has been requested. If you see the "upgrade" button on your individual file then that file is a candidate for quicker turnaround than initially ordered. Note that you can only increase the speed of service level. If you do not see the upgrade button but still wish to expedite the processing for a file or a number of files you will need to email support@3playmedia.com with this request. From your files list, locate a file that is in the pending state and click the upgrade button. After you click the upgrade button you will be directed to the Upgrade Turnaround Level Screen. 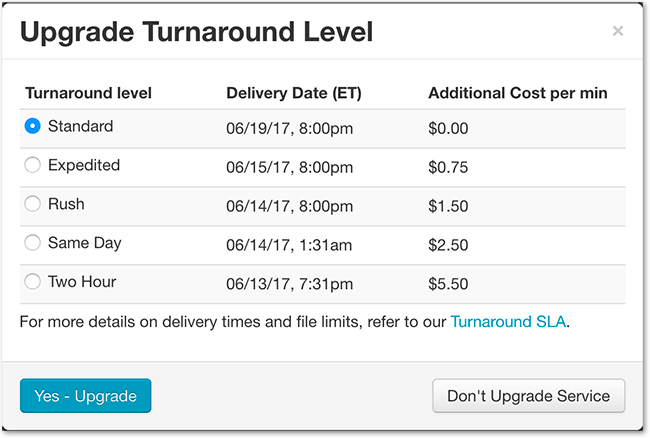 Select the new turnaround service level you would like to upgrade to and click "Yes - Upgrade". Your file will now be set to the new turnaround service level you just selected!